This is the first in a series of blogs that will feature our free SmallTalk apps available for the iPad®, iPhone® and iPod touch® on the App Store®. At Lingraphica, we understand that a communication device may not be a good fit for everyone. This is why we offer a number of products, services and apps – for free! We want to be a resource for anyone working hard to improve a speech or cognitive impairment. This month we explore SmallTalk Oral Motor Exercises. 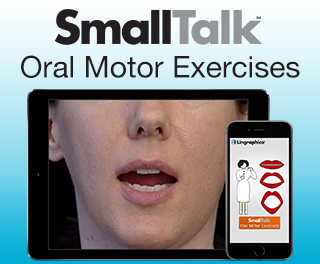 The SmallTalk Oral Motor Exercises app was created for people with weak mouth, tongue, and lip muscles and/or poor oral coordination. The app contains exercise videos focusing specifically on strengthening cheek, tongue, palate, lip, and jaw muscles. Once the app is downloaded, you can choose from over 54 different exercise videos. Each exercise is an individual video so you can focus on just the exercises you need. SmallTalk Oral Motor Exercises is easy to use and is a great rehabilitation resource for anyone recovering from aphasia or apraxia. Download the app to your iPad or iPhone today!